A single tip took animal rights activists to an illegal abattoir in China. That’s where China Animal Protection Power, or CAPP, found 375 cats jammed into wire cages awaiting slaughter. 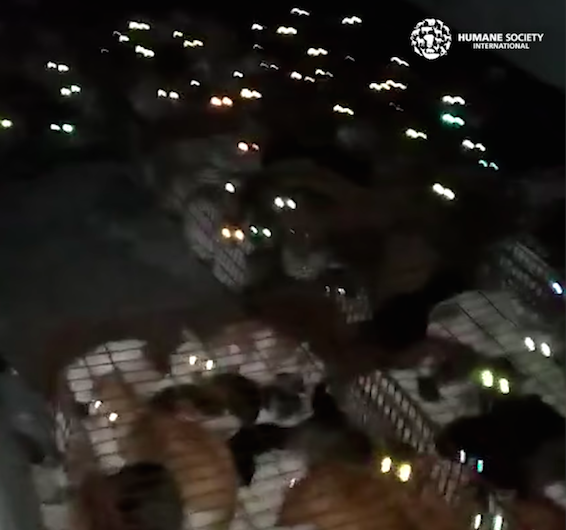 Humane Society International shared the shocking video of the conditions that cats were being kept in at the Tianjin facility in northeastern China. The cats will ill and in the dark. The video is incredibly upsetting. But these cats were the lucky ones. According to Newsweek, a young man who was looking for his missing cat stumbled upon the slaughterhouse. He had suspected his pet was stolen as part of the illegal pet trade. His discovery prompted the raid on the facility, where activists found the remains of thousands of other cats already killed there, in addition to 24 cages of 375 live — and unwell — animals. The animals are now being cared for and police are investigating.